Please note: if you fail to attend your appointment without giving 24hrs notice, a cancellation fee will occur. Some people are not always aware about the moles or marks on the skin. They can change at anytime these should always be kept an eye on, any change in colour, shape, size or become raised you should seek medical advice. Can make the skin itchy red, scaly, dry, cracked, or blistered. It is highly contagious and can spread around the body, it is easily treated. Occurs when a sharp corner of the toenail digs into the skin at the end or side of toe. This can be managed with regular treatments to stop it reoccurring. This is caused through trauma, and will never correct itself. Keeping the nail thinner can make the nail look more regular. This is when the nail becomes over grown and begins to curl like claws or rams horn. This is caused when the body’s ability to produce its own natural oil to keep the skin supply is reduced. This develops when the skin rubs against bone, shoes or the ground. 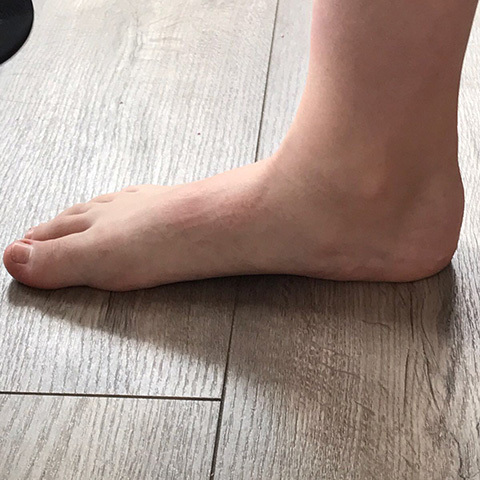 They form over the ball of the foot because this takes the weight and pressure when walking. Is thickening of the epidermis. When to much keratin is produced heavy thick callus occurs. Caused through the build up of hard skin, when it gets too dry the skin cracks and fissures form they can bleed and allow entry of infection if not treated. tip & top of toes the ball of foot or side of foot. A soft corn is in between the toes the skins surface is thinner appears white soft spongy tissue. Seed corns are tiny, can be in isolation or in a group on weight bearing areas, on the ball of the foot or heel. In areas of high pressure and torsion a hard corn with elements of nerve and vascular tissue are within the nucleus. Is a corn underneath the nail plate, causing pain and onycholysis (nail separation). Verruca: A wart by another name, a local growth of the outer layer of the skin (the epidermis) caused by a virus. 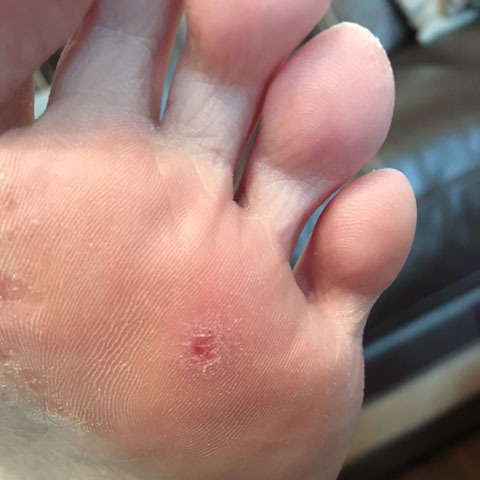 The virus of warts, Verrucae are caused by an infection of the skin by a virus called the Human Papilloma Virus (HPV), there are 135 different varieties of verrucae. You are born with the Papilloma virus and when the body goes through a form of stress, hormonal change, run down. We can be especially prone if your immune system is weakened for example. Cryotherapy involves freezing a verruca using a cold substance called Liquid Nitrogen. This is a very cold substance as the freezing and thawing assists in destroying the verruca tissue. Forming a blister to separate the epidermal tissues. Salicylic Acid treatment is stronger than regular ‘over the counter’ (OTC) treatments from your local pharmacy. This puts moisture in the area to change the environment the verruca is living. Is a strong caustic and keratolytic topical agent used to destroy skin lesions. A local anesthetic (Mepivacaine® 3%) will be administered by tibial nerve block, ankle, digital block or local infiltration according to the location of the lesion chosen for needling. Once the area of skin is anaesthetized, any overlying callus will be removed. The lesion will be punctured through the to the subcutaneous tissue. You will be issued with post-operative care sheets and advised to lightly shower and wash the area after keeping the dressing dry for 24 h. The wound will be checked one week later. The final inspection for verucca will be carried out 8 weeks later. This is performed when the nail is persistently in growing, involuted or a subungual corn occurs. Part or total of the nail can be removed. 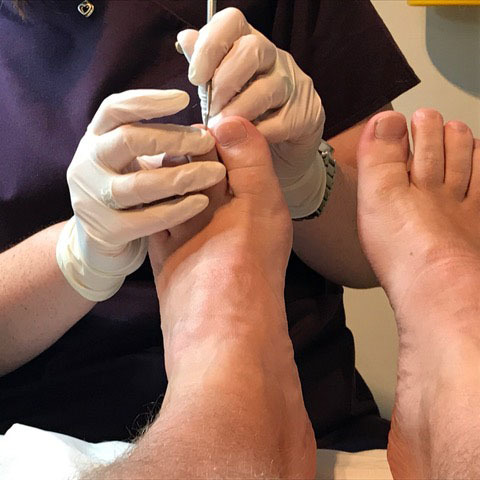 In this treatment I will use a local anaesthetic (Mepivacaine® 3%) that will be administered into the toe, a tourniquet ring is used around the toe. Phenol will be applied to the nail bed to stop the nail from growing back. Dressings are generally changed every other day and are kept on for at least 4-6weeks depending there is no infection. We all want the best for our little ones, but they can have so many problems growing up. Sometimes we just need a bit of guidance. I do an annual review for diabetes vascular, neurological and sensory tests. Check pulses, temperature, skin condition. This can be put into a report and sent to GP if needed. Where the body’s immune system attacks and destroys the cells that produce insulin. Where the body doesn’t produce enough insulin, or the body’s cells doesn’t react to insulin. 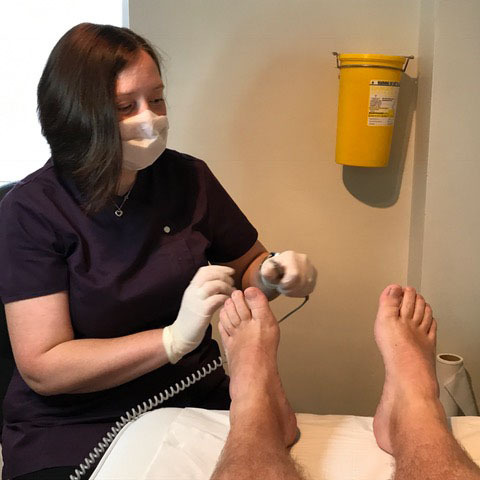 These are classed as a group of high-risk patients that are more prone to infections and nerve damage, so regular podiatry treatments are recommended. Biomechanical problems can stem from misalignment of the hip, knee, ankle or foot. I will carry out an assessment of the lower limb, spine, and pelvis alignment. Looking at the range of motion in joints, muscle weakness, reduced muscle bulk. I can do reports for referrals to gps, consultants, for further investigation if needed. 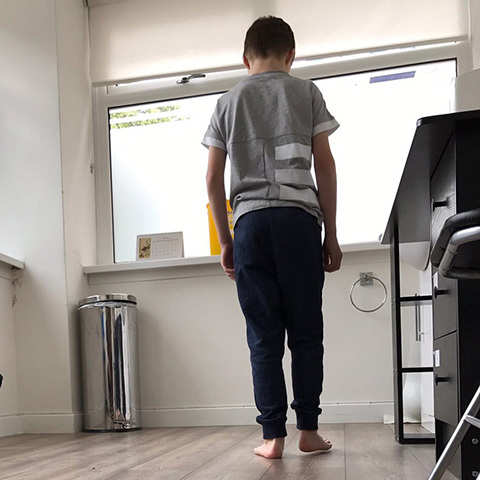 There is a range of treatments that I can help advise you to use from exercise, stretching, strengthening techniques. 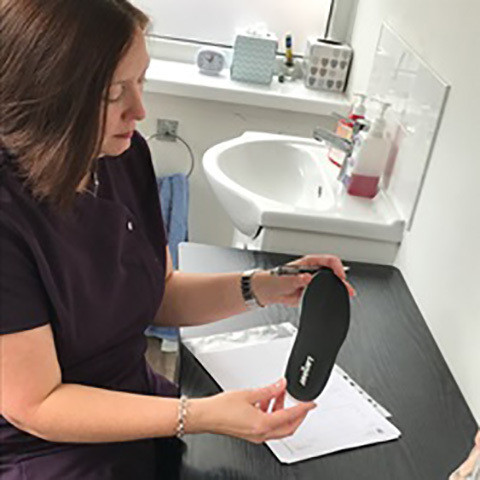 I can prescribe simply insoles and casted bespoke orthotics depending on need. I've been practicing reflexology since 1999. I use the Alexander technique helping to reduce stress, relieve pain, and promote health and well-being. The ancient Chinese practice reflexology, it is a manual therapy focusing on the feet. 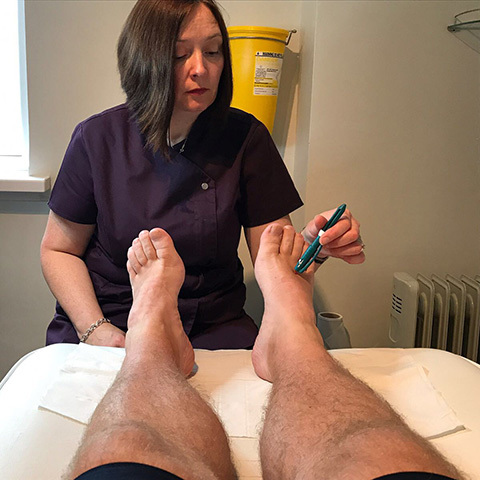 Reflexologists believe that different areas on your feet correspond to parts of your body, and massaging them stimulates your parasympathetic nervous system to heal itself. On your initial consultation, I will ask you about your medical history, health issues, lifestyle and diet. 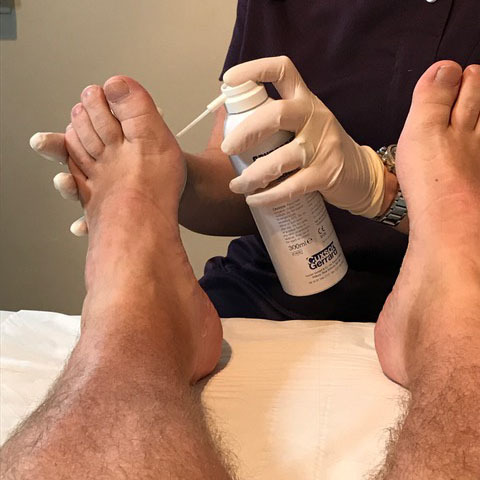 I will then apply painless pressure to your feet using my thumb and forefinger to identify and help in restoring the body back into a relaxed state. Sessions usually last 30 to 45minutes. There is no doubt that all of us get tired and exhausted after a long day at work. No matter what kind of job you do, you do get weary at the end of the day. After all, this can be one of the best activities to de-stress. I often see people that prefer this treatment because it refreshes them and makes them energized, as this is a very relaxing therapy for the feet.